As dawn breaks over Katingan, men and women set out to collect rattan, an activity that will keep them busy until the end of the day. But for many of them, there are low expectations of financial gains from this activity. 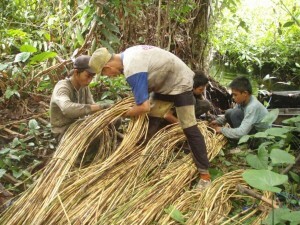 And yet, rattan remains a popular commodity around the project area: it grows fast and it is resilient. There are 3 main types of rattan: sigi, irit and bulu. Once planted, they typically grow up to 2 m every year, and can be harvested after 5 years. These rattans are soft and flexible, and are usually shredded into ropes to weave mats, baskets, bags and fish traps. Other types of rattan, known ashalatung, dahanen and ahas, grow naturally in the wild and have a bigger trunk. They are used as materials to make fish traps or furniture such as tables. The price of raw rattan is approximately 2,000-2,500 rupiah per kilogram, and a local rattan farmer typically makes around 25,000-30,000 rupiah per day. But the price of rattan has been falling. In 2009, the Government of Indonesia set an export quota for rattan products and a local trading company in Katingan has a monopolistic control over the local industry, which allows it to set the buying rate of raw rattan at a minimum. This has caused direct economic hardship on rattan farmers who depend on this industry to earn an income. For this reason, rattan is the option of last resort when fish are difficult to catch and crops yields fail.